As a comprehensive solution, Lumify extends the benefits of ultrasound to more places by leveraging cloud-enabled and tablet technology, and bringing connectivity, flexibility and mobility into the hands of more healthcare providers. Two advanced ultrasound transducers, app-based online portal and subscription platform now offered as part of comprehensive portable, connected digital solution. 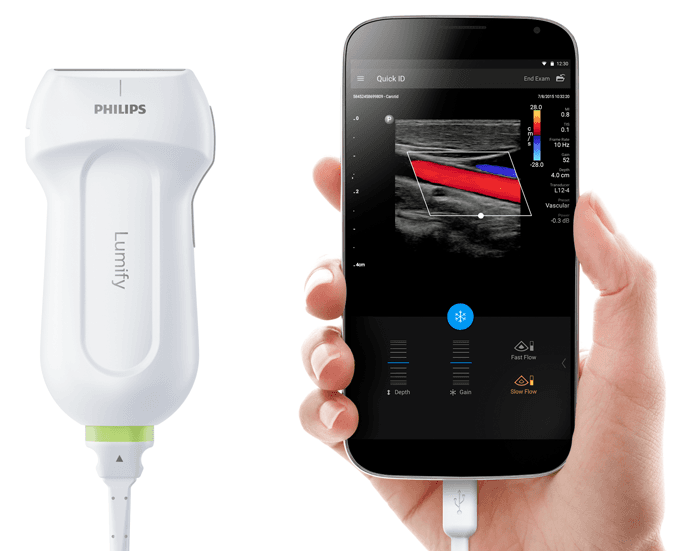 AMSTERDAM – Royal Philips announced that Lumify, a smart device ultrasound solution, is available for purchase by licensed healthcare providers or organizations in the U.S.
Lumify is offered as part of a novel subscription model unique to the industry. From Philips’ online portal, users will be able to order transducers, manage flexible subscriptions and access Philips’ support, training and IT services through the new offering. Philips’ new ultrasound digital health approach connects off-the-shelf compatible smart devices, a mobile application, advanced ultrasound transducer technology, integrated IT and support services to help healthcare providers improve patient care and reduce costs. Since debuting the smart device ultrasound concept in 2014, Philips has enhanced the solution for more clinical uses including acute care and office practice. As a comprehensive solution, Lumify extends the benefits of ultrasound to more places by leveraging cloud-enabled and tablet technology, and bringing connectivity, flexibility and mobility into the hands of more healthcare providers. Available with a monthly subscription starting at an introductory price of $199, Lumify allows institutions to scale their ultrasound solution to meet their needs and environment without having to purchase imaging equipment. The subscription includes a transducer, app, access to the online portal, warranty and Philips’ support. Designed to help make ultrasound more accessible, Lumify operates on user-supplied compatible Android smart devices equipped with Internet and email functionality. To use Lumify, users download The Lumify App from Google Play, connect their Philips transducer to their compatible smart device via USB and launch the app to begin scanning. The Philips transducers available as part of the subscription support Lumify’s use in acute and emergency care, internal medicine, musculoskeletal (e.g., orthopedics, sports medicine and podiatry) urgent care and office practice. Philips’ advanced transducer technology, paired with cloud-enabled and tablet technology, helps users make fast, informed diagnoses through a variety of scan types. Lumify’s scanning app allows users to examine the gall bladder, abdomen and lungs, in addition to having ob-gyn, vascular, superficial, musculoskeletal and soft tissue functionality. Beyond integrating with everyday technology such as personal, off-the-shelf, compatible smart devices, Lumify also uses cloud-enabled technology to connect with PACS, shared networks and system directories. Additionally, data will be accessible on the Philips HealthSuite Digital Platform, an open and secure, cloud-based IT infrastructure, allowing clinicians and health systems access to powerful data and analytics to help improve patient care. Lumify is a solution that will grow with its users, with plans for regular software updates and additional transducers, services and apps being released at regular intervals. At this time Lumify does not have FDA clearance for pre-hospital / paramedic use. At this time, Lumify is only available in the USA.